The Ring Video Doorbell 2 and Ring Stick Up Cam provide easy and effective ways to set up a pretty strong security perimeter around the outside of your home, but it could be made considerably stronger with the addition of its new Spotlight Cam. This outdoor camera/porch-light hybrid, illuminates and records video when when its motion sensor is tripped. Ideally suited for the darker nooks and on your property that are susceptible to breach after sundown, it comes in three models: Spotlight Cam Battery, Spotlight Cam Solar, and Spotlight Cam Wired ($199 each). I tested the Spotlight Cam Wired and it’s a great option if you have easily accessible outdoor power outlets. The 4.96-inch-by-2.72-inch-by-2.99-inch camera has a 20-foot power cable attached at the back as well as a built-in wall mount, and unlike the others you won’t have to worry about dead batteries or a succession of overcast days interrupting your surveillance. The spotlight is provided by an LED light strips on either side of a 140-degree wide-angle lens, which activate when motion is detected. Tho motion sensor, encased in a dome on the bottom of he camera, has a 270-degree detection range. The camera streams and records video in up to 1080p resolution and supports two-way talk with noise cancellation and night vision up to 30 feet. The Spotlight Cam Wired has a 20-foot power cord for use with outdoor outlets. The Spotlight Cam comes with 30-day free trial of Ring's cloud storage for recorded video. At the end of the period, you have the option of upgrading to one of a pair of Ring Protect plans: Protect Basic allows you to store, review, and share video for up to 60 days for $3 per month or $30 a year per camera. 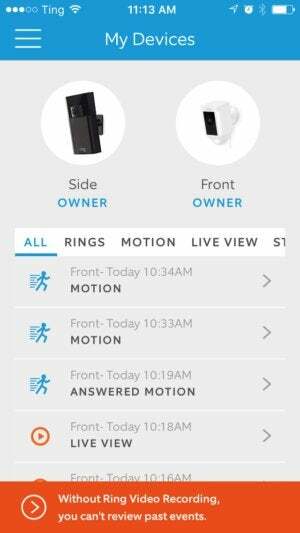 Protect Plus provides the same for unlimited Ring cameras—including the Ring Video Doorbell—and adds a lifetime warranty and discounts on Ring products for $10 per month or $100 a year. 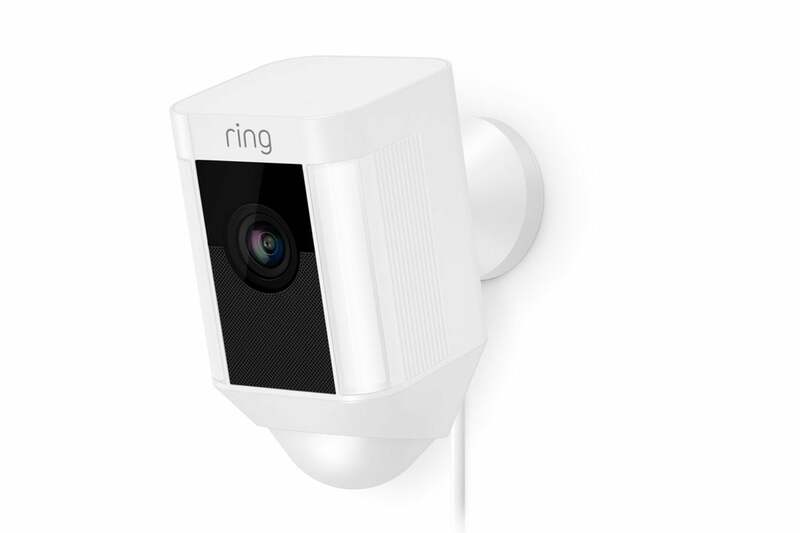 If you use the Ring Protect Base Station, a new smart home hub that will be available in November, the Plus package also provides Ring Response 24/7 professional monitoring and battery and cellular backup to keep your camera running if your internet connection goes down. It’s recommended you connect your Spotlight Cam to your Wi-Fi network before mounting it outside. Once you add the camera to the Ring companion app, the camera’s voice prompts guide you through the connection process. After this setup process, I unplugged the camera and took it outside to the area where I wanted to mount it. I plugged it in at the new location and activated the live stream. There was no drop in video quality, so I installed the camera using the supplied tools and mounting kit. Results will vary depending on the layout of your home, of course, but if you do see streaming issues like resolution deterioration of loss of signal, you many need to install the camera closer to your router or use a Wi-Fi range extender like the Ring Chime Pro. You can access any other active Ring cameras along with the Spotlight Cam from the Ring app’s My Devices screen. 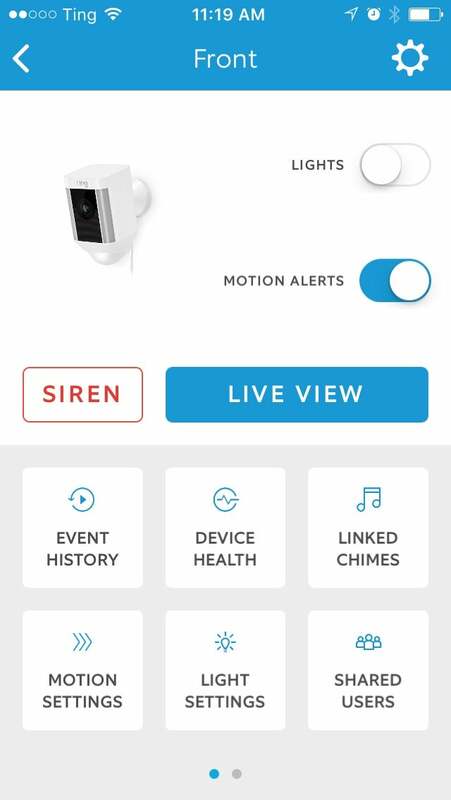 Here, you’ll also see a running feed of all detected activity, which you can filter to view only those triggered by motion or button presses (in the case of the video doorbell), and those you’ve starred as noteworthy. Tapping the Spotlight Cam icon opens a dedicated screen with all the camera’s controls laid out. The Ring app is one of the best in this regard, as it doesn’t require you to go hunting through nested settings menus to find what you need. At the top are on/off toggles for the camera’s lights and motion alerts. Using a selection of buttons below these, you can open the camera’s streaming feed, event history light settings, and more. The image quality was sharp with even lighting and none of the color tinting I encountered with the Ring Stick Up Cam. When you’re viewing the live stream, you can communicate with a visitor—or interloper—using a pair of phone icons that display on the image. You can also manually turn on the spotlight from this screen. 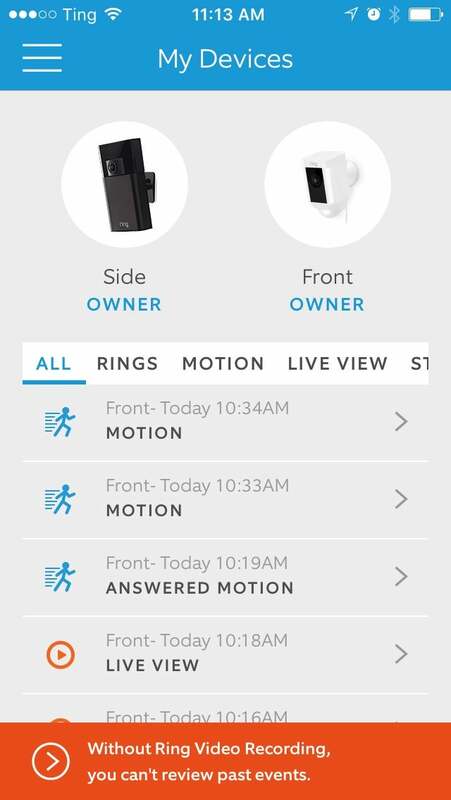 The Ring app puts access to all the Spotlight Cam's controls on a single page. Motion detection was responsive and accurate with the default settings, which placed the sensitivity midway on a scale between “people only” and “all motion.” You can adjust this your liking with the slider, or use it in combination with customizable motion zones. The Spotlight Cam employs the common method of using bounding boxes over the camera image to define detection zones, but you can use the box handles to twist it into any kind of geometric shape rather than being limited to only squares. That allows you to work around precarious outdoor areas where you don’t have as much control over the environment as you do inside your home. There’s also a scheduling option to disable motion alerts during certain times of day. You can set motion zones for the lights, too. In this case, the app shows a graphic representation off the motion sensor’s 270-degree range and you can define where you want movement to turn on the lights by tapping up to three preset zones and then expanding or reducing coverage in those zones using a slider. Depending on your settings, the light will stay on for one to 15 minutes. At max power, the camera’s lights were more than enough to light up my modest sized side yard. Depending on the size of yours, you might want to dial down the intensity in the app. 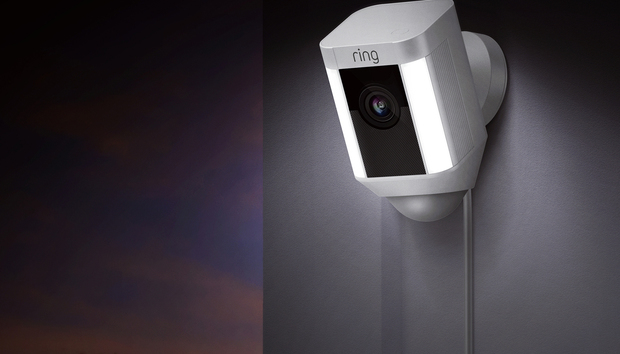 The Ring Spotlight Cam is an impressive camera, and it effectively fills a necessary niche: providing security for yards, carports, and other spots around the perimeter of homes that become particularly vulnerable after dark. While it will work great as a standalone camera, it will shine as part of more comprehensive security set up with other Ring cameras—I used it in conjunction with the Ring Doorbell and a Stick Up Cam—to achieve a 360-degree view of my property.